I was even more stunned when I saw parents clapping on their performance????? I was about to recover from this shock and I learnt that they learned those steps and song at their school. I was dumbfounded. These kids have been hearing this song on TV almost every day and learnt it better from their classmates. The reason being, their pre-school was making them perform on same song during their Annual function!! Now, I don’t want to name those branded pre-school but what kind of culture these pre-schools are incepting at the name of fun??? Away from home, pre-school is the only place which has major impact on a child’s psychology. Years ago, Gurukul was the source of education in our country. It was one of the most vital aspects in building a child’s character. Learning and Knowledge linked with concentration, sincerity, dedication and loads of hard work. But, times changed and we started adapting concept of “Fun into learning” from West, who said and believed it is ‘Fun to Learn”. However in our endeavor to learn from the West, unfortunately we started copying their evils even in the education arena. So, in India Fun to learn has converted into Fun and Learn. Is balance missing in your child? The fun part has to be included to make children expressive and multi-skilled which are important too, yet most important aspect is to preserve the innocence of child. I am a little disappointed to see that the balance is missing. 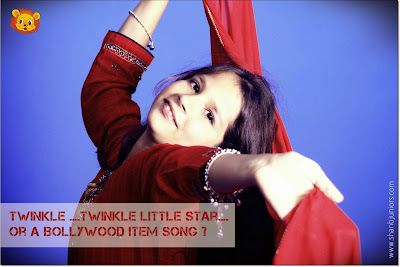 Why can’t our child enjoy the ramp walk on a nursery rhyme like “Twinkle Twinkle little star… or humpty dumpty”? Something that has suitable lyrics and music for the little ones. Continuing this imbalance, Let’s expect The high school students enjoying the beer parties! Today’s Pre-Schools are miserably failing to imbibe values in a child as it seems that Fun & Learn have divorced each other. As a result of that, I was miffed at the above incident and if this imbalance continues, I will not be surprised if we hear stories of high school students enjoying beer parties in future? What are the schools doing to our children? What kind of environment are we providing to our little ones? Will we be able to preserve their innocence? Did you as parent ever asked or thought about these serious Questions before choosing a Pre- School for your little one? Be a alert parent and carefully select your child’s Pre School. Shanti Juniors, Yes We assure the balance! I am not positive where you’re getting your info, but great topic. I needs to spend a while studying much more or understanding more. Thanks for magnificent information I was on the lookout for this information for my mission. hello!,I really like your writing very much! percentage we keep in touch extra approximately your article on AOL? I need a specialist on this space to unravel my problem. May be that is you! Taking a look ahead to peer you.